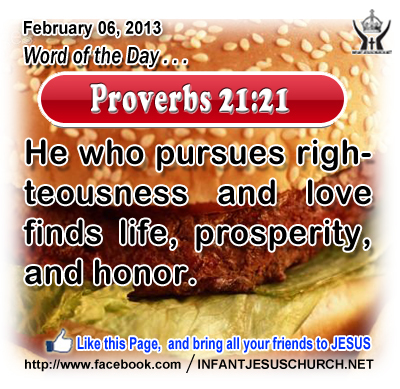 Proverbs 21:21: He who pursues righteousness and love finds life, prosperity, and honor. Heavenly Father, Giver of every good and perfect gift, we ask today that you give us a chance to serve you and others in a way which shows your kingdom and its glory. If in the process you choose to meet the needs in our own heart, then we thank you. This we pray through Infant Jesus. Amen. 1He went away from there and came to his own country; and his disciples followed him. 2And on the Sabbath he began to teach in the synagogue; and many who heard him were astonished, saying, "Where did this man get all this? What is the wisdom given to him? What mighty works are wrought by his hands! 3Is not this the carpenter, the son of Mary and brother of James and Joses and Judas and Simon, and are not his sisters here with us?" And they took offense at him. 4And Jesus said to them, "A prophet is not without honor, except in his own country, and among his own kin, and in his own house." 5And he could do no mighty work there, except that he laid his hands upon a few sick people and healed them. 6And he marveled because of their unbelief. And he went about among the villages teaching. Jesus startled his familiar audience with a seeming rebuke that no prophet or servant of God can receive respect among his own people. The people of Nazareth took offense at Jesus and rejected to listen to what he had to say. They despised his preaching since he was a mere workman, a carpenter, and a layman who had no formal training by a scholar or teacher. They also reviled him because of his ordinary family background. How familiarity can breed dislike. Jesus could do no mighty works in their midst because they were closed-minded and skeptical towards him. If people have come together to hate and to refuse to appreciate, then they will see no other point of view than their own and they will say no to love and accept others. How do we treat those who seem disagreeable to us? Loving Infant Jesus, you are the fulfillment of all our expects and desires. Your Spirit brings grace, truth, liberty, and abundant life. Set our heart on fire with your love and truth.